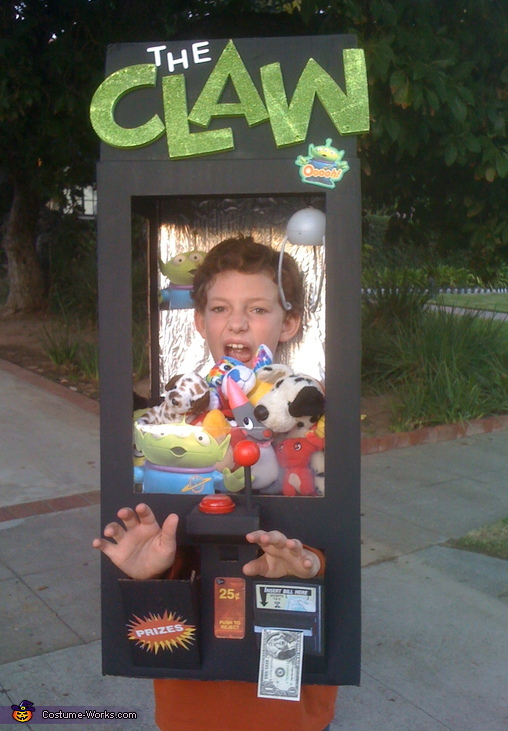 My son Will is dressed as "The Claw" - the game where you try to grab prizes with a claw! We took a box and cut windows on three sides, then cut some additional pieces of cardboard to make the platform for the joystick, as well as a support "shelf" for the stuffed animals. We cut open a clear plastic container and taped it to the lower part of the front window so the animals wouldn't fall out. We also hot glued some shoulder straps inside to support the weight of the box (it wasn't very heavy.) We spray painted it black and glued aluminum foil to the back wall of the box so it would look like a mirror. We spray painted a pen and rubber ball as the joystick, and the top of a plastic toy box for the button. My husband bent some aluminum wire to construct the claw, then we printed the photos of the Toy Story aliens, the dollar bill slot and coin return and you have... "THE CLAW!"